A Beginner's Guide to Meditation: How do I Meditate? 1. Pick a time of day that will work for you. It may be first thing in the morning, 5 minutes at work over your lunch hour or 5 minutes when you get home from work. 2. Find a quiet place where you won’t be disturbed and listen to the 5-minute guided meditation. 3. Sit comfortably with your back upright. Most people prefer to meditate in a chair rather than cross-legged. What’s most important is that you’re comfortable and you won’t be in a position that will cause you to fall asleep (although it’s okay if you do fall asleep). 4. Set a timer or look at your watch to determine 5 minutes. My favorite timer is the Insight Timer, which is a free app that times your practice and lets you know how many people around the world are meditating with you. It also tracks the number of days you’ve meditated in a row. This is great motivation, especially when you’re trying to create a new habit. In addition, it has thousands of guided meditations that you can access for free. 5. Close your eyes and bring your attention to your breath. Breathe in and out and notice where you experience your breath. For most people, it’s in one of three areas: you may notice the air moving in and out of your nose, or your chest rising and falling, or your belly moving in and out. 6. Continue to focus on your breath and when your mind wanders to a thought, sensation, or sound in your environment, gently bring your focus back to your breath. 7. It doesn’t matter how many times you need to bring your mind back, just keep bringing it back to your breath. 8. Continue for 5 minutes or until your timer goes off. Gently open up your eyes and start going about your day. Now that you’ve mastered the 5 minutes, you can slowly increase the length of time to fully experience the benefits. While there are lots of differing opinions about how long and the frequency you should meditate for, there is solid evidence that 20 minutes twice a day is a great goal. I always meditate first thing in the morning for 20 minutes and then again later in the afternoon for the same amount of time. When I have to miss a session, I’m kind to myself and remind myself that: I’m going for progress, not perfection. In actuality though, meditation has become like brushing my teeth and I just feel off and less fresh when I don’t do it. It will begin to feel that way for you too, once you get in the habit. 2. FIND A QUIET PLACE WHERE YOU WON’T BE DISTURBED AND LISTEN TO THE 5 MINUTE GUIDED MEDITATION. 5 MINUTES. 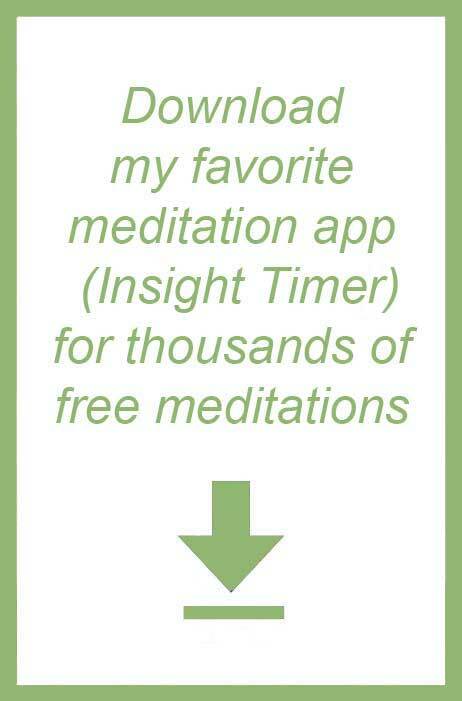 MY FAVORITE TIMER IS THE INSIGHT TIMER, WHICH IS A FREE APP THAT TIMES YOUR PRACTICE AND LETS YOU KNOW HOW MANY PEOPLE AROUND THE WORLD ARE MEDITATING WITH YOU. IT ALSO TRACKS THE NUMBER OF DAYS YOU’VE MEDITATED IN A ROW. THIS IS GREAT MOTIVATION, ESPECIALLY WHEN YOU’RE TRYING TO CREATE A NEW HABIT. IN ADDITION, IT HAS THOUSANDS OF GUIDED MEDITATIONS THAT YOU CAN ACCESS FOR FREE. 5. CLOSE YOUR EYES AND BRING YOUR ATTENTION TO YOUR BREATH. BREATHE IN AND OUT AND NOTICE WHERE YOU EXPERIENCE YOUR BREATH. FOR MOST PEOPLE IT’S IN ONE OF THREE AREAS: YOU MAY NOTICE THE AIR MOVING IN AND OUT OF YOUR NOSE, OR YOUR CHEST RISING AND FALLING OR YOUR BELLY MOVING IN AND OUT. 6. CONTINUE TO FOCUS ON YOUR BREATH AND WHEN YOUR MIND WANDERS TO A THOUGHT, SENSATION OR SOUND IN YOUR ENVIRONMENT, GENTLY BRING YOUR FOCUS BACK TO YOUR BREATH. 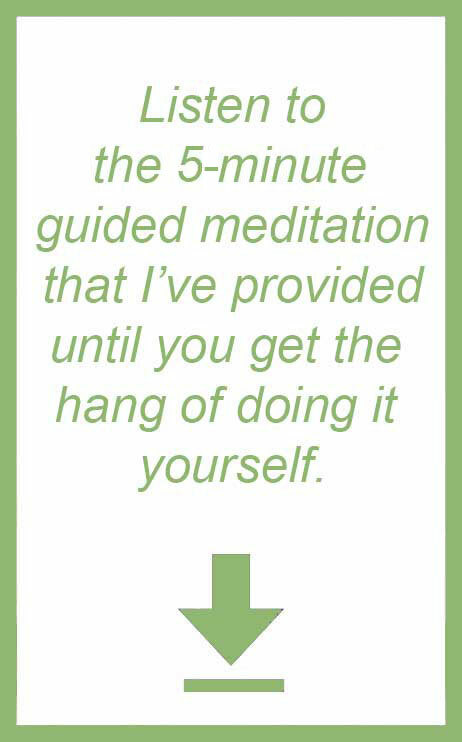 Now that you’ve mastered the five minutes, you can slowly increase the length of time to fully experience the benefits. While there are lots of differing opinions about how long and frequency you should meditate for, there is solid evidence that 20-minutes twice a day is a great goal. <— What is Meditation and How Will it Help Me?